A loan of $925 helped to hire workers to harvest organic beans. Akyz is 63, married, and the mother of five children. She has a college degree in education and receives a pension, though she hasn't stopped working as a librarian at the school. For many years she has also planted crops and raised livestock. Thanks to her hard work, she currently has a dairy cow and a 1.52 hectare plot of land where she grows beans for wholesale. Organic beans sell for a good price, and she also sells milk and apples. Akyz has started to harvest the beans, but she doesn't have the resources to finish, so she applied for a loan of 50,000 som (KGS) with Bai-Tushum Bank in order to hire workers and rent equipment to harvest the beans. She will use her profits to continue investing in her business and to buy a car for her family. Translated from Russian. View original language description. Акыз 63 года, замужем, мать 5 детей. У Акыз высшее педагогическое образование, она на пенсии, однако не прекращает работать в школе библиотекарем, также дополнительно много лет занимается полеводством и животноводством. Благодаря упорному труду, в хозяйстве Акыз на сегодняшний день имеется 1 дойная корова и 1,52 ГА земли, где Акыз выращивает фасоль для реализации оптовым покупателям. Экологически чистая фасоль пользуется большим спросом. Также она реализует молоко и яблоки. Акыз начала сбор урожая фасоли, однако не хватает средств для завершения, поэтому она обратилась в Банк «Бай –Тушум» за кредитом в сумме 50,000 сом (KGS), целью которого является найм рабочих и аренда сельскохозяйственной техники для сбора урожая фасоли. Доходы от кредита Акыз планирует вложить в дальнейшее развитие своего бизнеса, также планирует купить машину для своей семьи. This loan is part of Bai Tushum’s efforts to provide essential funds to help people in remote areas access lighting and heating or improve energy efficiency for their households during cold winters. Because it is funded through Kiva, the client will receive a 5% rebate of annual interest at the end of loan term if all repayments are made on time. By funding this loan, you are helping low-income clients improve their living conditions and reduce their ecological footprints. Bai Tushum Bank is a microfinance bank in Kyrgyzstan offering clients a range of products including loans for business development, trade, production, leasing, mortgage, consumption and more. Its portfolio is mostly comprised of group loans that cater to the broadest population of clients. Kiva lenders' funds help the bank expand its services in remote areas to impact and offer lower interest rates to even more vulnerable communities in Kyrgyzstan. Like Kiva, Bai Tushum Bank is interested in creating opportunities for the poor in remote areas. 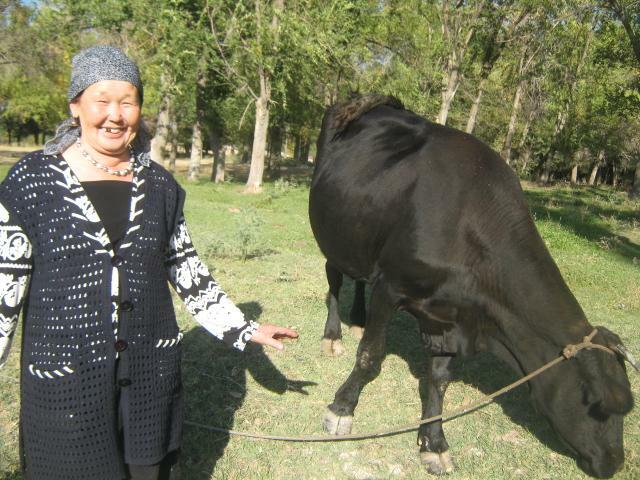 Bai Tushum means "rich harvest" in Kyrgyz, and the bank offers credit, deposit and remittance services to clients. The institution has impacted more than 30,000 clients through its lending programs. Kiva lenders' funds support the bank in expanding its social impact even more.